If upmarket shopping excites you, then the newly refurbished Paradise Park shopping centre is calling for your attention. Located on the outskirts of Bangkok not far from Suvarnabhumi Airport, Paradise Park known formerly known as the Seri Centre has now been remodelled. A joint venture group consisting of Siam Piwat Company and MBK purchased it in September 2008 for Bt975 million and after being extensive refurbishments taking over a year it had its grand opening to an excited crowd in August 2010. If you are familiar with the area then you will know that this was the old Seri Centre is on Srinakarin Road, just a few hundred metres from the Seacon Square shopping centre and located within a short walking distance of Suan Luang Rama IX Park. It is now more spacious with a light and airy feel; gone are the secondhand computer parts laid out on tables and the cramped and dark little sections. The landscapes surrounding the building are transformed into lush gardens with sparkling fountains and waterfalls. This is surely a place to rival the Emporium shopping centre for its size and grandeur. The major brands are all represented on the four floors. Starting on the ground floor there is a stage area for fashion and pop idols to come and perform. The stage is set in a large atrium so there are multiple viewing points from the floors above. Wind your way amongst the floors of fashion and top range electronics suppliers; find that amazing handbag that you have been seeking or even a small gift for that special someone in your life. Perhaps you are tempted to have a massage or spa treatment. How about Bronze Day Spa located on the third floor in the Promenade Wellness Centre near the Cineplex. They have a range of treatments and spa packages for all type of people and skin types; and all so reasonably priced. Sorry guys, the body massage is ladies only, but they will do facials and exfoliants if that is what you are after. Better still, leave your partner here for a tune up whilst you go and visit HomePro to check out the spanners. If you fancy a spot of lunch then check out the various themed restaurants in the Dining Paradise on the Third Floor or if you want to try some of the local Thai food then head to the Food Bazaar located on the Ground Floor. For those of you who want an extra special treat then why not consider going to the soi at the rear of Paradise Park and visiting Krua Mhai Ngam restaurant. The service is personal and the food is just a delight. 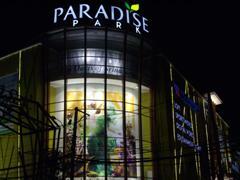 Whatever your shopping needs, you are sure to find that special something at Paradise Park.